German Technical Inspection Authority (TUV) approved user friendly ergonomics ensure maximum comfort during operation and reduce the risk of muscular disorders in neck and shoulders even over a prolonged stretch of time. A 50W HAL lamp is integrated in the stand, with its high light efficiency providing homogeneous illumination. An energy saving LED alternative is available. The system provides flexibility in selecting and switching between various contrasting methods, catering for a wide spectrum of applications. The 5x revolving nosepiece for bright and darkfield keeps all relevant objectives handy. A 4 position reflector turret with push&click contrast modules creates flexibility in selecting and switching between contrast methods. 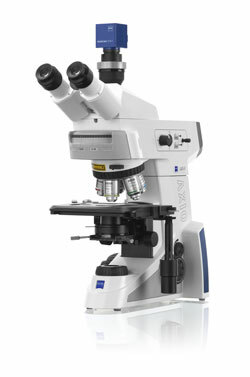 Note that Axio Lab.A1 is available with differential interference contrast (C-DIC), a technique that delivers excellent contrast in phase objects and other samples poor in intensity contrast. A comprehensive range of components is available for Axio Lab.A1 in order to configure the system for your application in metallography and general material lab microscopy. Eyepieces: PL 10x/20 Br. Foc., PL 10x/22 Br. Foc. The adaptable all-around stand for your routine and research applications – your microscope down to the last detail. 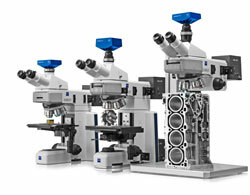 Customized microscope configurations – consistently implemented modularity. With its unusual flexibility, Axio Scope from Carl Zeiss can be used universally – and is yet individually tailored to your applications. Twenty-three Stand Versions. Innumerable Interfaces. An Outstanding Solution for Your Applications and Budget. The optimum solution for your application and your budget. Axio Scope is as individual as the applications you use it for. Copyright © 2012 Bartels & Stout, Inc.